Try to find one that is free of fragrance, or at least not too heavily scented. This is one area where buying expensive products is just throwing money away. Remember, the key word is mild. 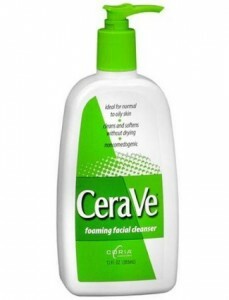 Cerave Hydrating Cleanser ($9.59, Drugstore.com) is one of my favorites; for very sensitive skin, Cetaphil Gentle Skin Cleanser ($9.19, Drugstore.com) can’t be beat.